The Logitech Unifying receiver is the heart of a new family of products that brings you wireless freedom and convenience without the hassle of multiple receivers. It's easy to pair up to six Unifying compatible devices, all to the same tiny receiver that never needs to leave your laptop. Now it's even more convenient to move around and work at the office, at home or on the road. And it’s easy to add a compatible wireless keyboard or mouse to the same receiver. Build your ideal combo. Add something. Replace something. It’s as simple as can be and you’ll use only one USB port. Your laptop is convenient. You use it on the couch, in the kitchen, at the coffee shop—wherever you want. Logitech makes your laptop as comfortable as it is convenient with portable mice and notebook-ready keyboards. The Logitech® Unifying receiver takes convenience a step further. The Logitech® Unifying receiver is a tiny, leave-in wireless receiver. 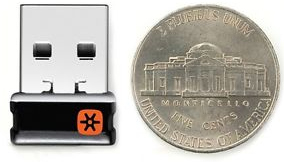 Smaller than most coins, the Unifying receiver not only makes it easy to use a wireless keyboard, mouse, or number pad, it also works with up to six devices. The Unifying receiver packs plenty of power. Built with Logitech® Advanced 2.4 GHz wireless connectivity, Logitech mice with the Unifying receiver give you the reliability of a cord—with the freedom of cordless. You’ll enjoy fast data transmission with virtually no delays or dropouts. With the tiny wireless receiver, there’s no need to plug and unplug when you’re on the move. Or deal with the hassle of multiple receivers. The tiny Logitech® Unifying receiver stays in your notebook and lets you add devices as you need them. The Unifying receiver is small and always ready. So small, in fact, you can leave it plugged into your USB port when you’re on the move—without worrying about breaking or losing it. It’s fast and easy to add a compatible wireless mouse, keyboard, or number pad to your receiver. You can mix, match, upgrade, or replace up to six devices—now or in the future—using just one USB port. To connect a new device, you simply open the connection software, click “Pair new device”, and turn the device off and on. That’s it. A simple but wonderfully functional technological innovation. There is no longer any need to have a separate receiver plugged in for each wireless device. Give the Logitech Unifying Receiver a try … It makes computing simpler and less cluttered.